One of the most famous natural attractions in Grand Cayman Island is Stingray City. This is an area in the ocean not far from the northern tip of Grand Cayman where tourists can get up close to hundreds of friendly stingrays. Stingray City can get quite crowded especially when the cruise ship passengers are at port. Fortunately for us scuba divers, the masses are taken to a shallower section of Stingray City where the sandbars are high enough for tourists to stand in waist deep waters. 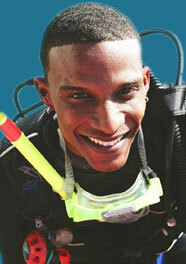 Scuba divers are taken by one of the many dive operators in Grand Cayman to the deeper part of Stingray City. However, this deeper section is still very much a shallow dive by scuba diving standards. In fact, Stingray City has been referred to in the scuba diving world as the best twelve foot or four metre dive in the world. It is believed that many years ago, sailors visiting the area threw fish remains overboard and soon noticed the stingrays coming for the free food. These particular stingrays became conditioned over the years to the humans and the food handouts unlike stingrays elsewhere in the Caribbean. If you have seen stingrays during dives elsewhere in the world, you will have noticed that they are usually quite shy and will swim away but not those here at Stingray City. The dive boat took us to a designated site and indeed the depth was very shallow as we could easily see the bottom. The site itself was pretty barren with just the odd reef cluster around a mostly sandy bottom. The divemaster gave us a briefing on how to interact with the stingrays warning everyone that even though they will appear to be friendly, they should still be regarded as wild animals. We were told not to touch them by their razor sharp tails or abuse them in any manner. A bucket filled with squid parts was suspended in the water underneath the dive boat and this is where we fetched our supply of food to feed the stingrays. As soon as we jumped in the water and made our descent to the bottom, we could see the first few stingrays coming towards us like UFOs. The divemasters showed us a trick where if we held the squid in our closed fists and moved our arms in wide circular arcs around us, we could make the stingrays follow our hands. It was sort of like teasing them for a bit before giving them their treats. Their mouths were located underneath their flat bodies and we were instructed to hold the food in our palms flat facing up when feeding them. The divemasters had demonstrated this on the boat using a little stuffed stingray toy during the briefing. With their keen sense of smell, the stingrays hovered towards and over the food to collect their squid snacks. It's was incredible to see how fast they could stop in the water if they sensed food. They don't have any teeth but have these two strong structures like vise grips in their mouths they use to chomp with. Feeding them sometimes felt like a vacuum cleaner sucking up debris on our palms. Sometimes, we felt their vise grip mouths close up against the flats of our palms. This is why we were advised to keep our palms as flat as possible in order to avoid them from closing up on our fingers. Because the eyes of the stingrays were on the top of their bodies, they couldn't see our palms when they hovered directly over them. They would have to guess where our palms and the food were. At one instance, I was holding on to the food a little too long in order to further tease one stingray. This one missed my palm and his jaw closed down on my forearm instead leaving me with a nice bruise. It was my fault since the stingray couldn't see and thought that my forearm was my palm holding the squid. I was a bit careless and should have paid more attention to where the stingray's mouth was. No other diver on our boat had any other problems or mishaps. Some of the stingrays although not aggressive, will be all over a diver if they still sense food but couldn't find the palm. It was hilarious to watch some other divers pushed over on the sandy bottom by a stingray trying to find the squid. One large stingray even bumped me in the scuba mask but it was all fun. If the stingrays sense that a diver doesn't have any food after awhile, they will go towards another diver that does. The Stingray City dive is a single tank trip usually done in the afternoon. It is a unique dive that is worth doing but keep in mind that the stingrays are the main and usually the only attractions during this dive. There isn't much else to see in terms of other marine life or coral reefs at the site so it would be advised to spend the morning doing some regular reef dives too in order to take in what Grand Cayman scuba diving has to offer.